So last night I had an excuse to draw a bath and relax. I received a Natural Bath Fizzer from One Bath and Body. They have 4 to choose from and I got to try the Honey Please to “Calm my Spirit”. You have the option to use a whole bath fizzer for a long relaxing bath or half just in case you get that knock on the door and hear the words…”I gotta pee”. I chose to do half in case that happened and I really enjoyed the scent. Even this morning when I got in the shower I could still smell my retreat from the night before. I had no reaction to it and I have sensitive skin when it comes to bath products. I loved how it dissolved and I didn’t feel any grittiness between my toes and other places. 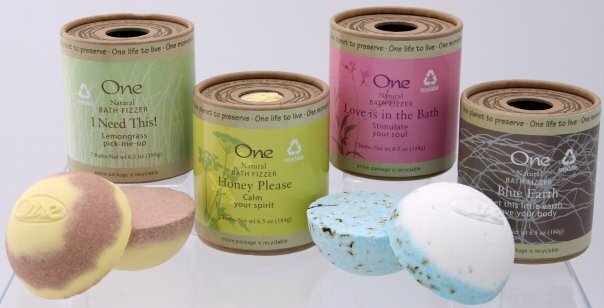 The One Bath Fizzer retails for $5.99 and well worth it to have a little mini spa retreat in your own home and have the smell last all night. I really like the fact that one is an all natural, no plastic, promotes recycling and is a cruelty free kind of company.